SONOMA COUNTY — Along Highway 12 in Northern California's wine country, whole neighborhoods are now just sidewalks and stone driveways; the hills around are charred. Block after block of multistory homes have collapsed into piles of soot. Brick chimneys jut skyward toward roofs that are no longer there. 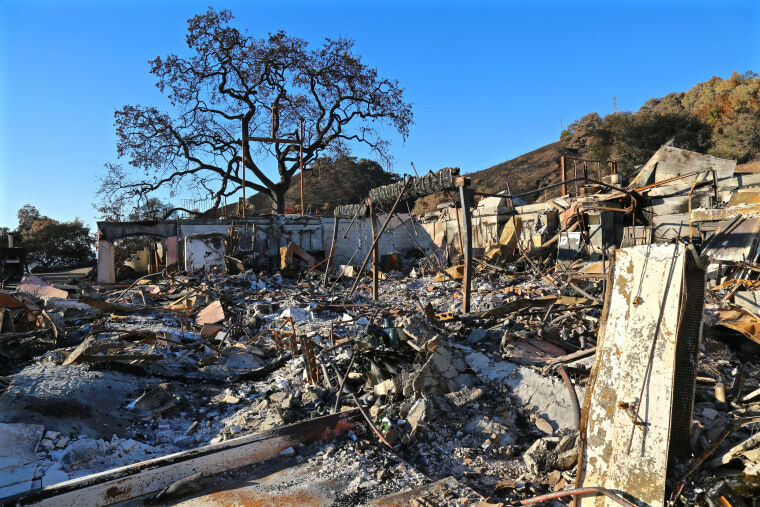 For residents of these devastated communities, the speed of recovery depends entirely on geography; the luck of the land and how fire tore through it. At Santa Rosa's Paradise Ridge Winery, owned by the Byck family since 1978, the vineyards are intact — but the winery building that housed up to 8,000 cases of wine and the tasting room burned to the ground. Rene Byck, the winery’s co-owner and vice president, shows his family the property for the first time since the Tubbs Fire tore through it the morning of October 9. “Dad, where’s the winery?” asks son Brycen, age 6, trailing behind his father. The winery building is in ruins of gnarled metal, charred barrels, and more nails than you can count. It smells of soot and fermenting grapes — within the blackened barrels, nature moves along turning grapes into wine, unaware. The family home, 10 minutes away, survived the fire. But Byck watched on security cameras as the flames reached the front doors of his tasting room. “It was then that the camera cut out — when the power went out,” Byck told NBC News, crunching through shards of glass where the wooden deck and entrance to the tasting room once were. By Friday, 13 of Santa Rosa’s schools reopened, and Byck’s children went back to class for the first time. He says 10 of the 25 kids in his daughter’s class lost their homes to the fire. For now, there is no power or water at Paradise Ridge, and — like many in wine country — it's not permitted to start cleaning up debris until the area is inspected. Byck hopes to be back open for business in early 2019, and to open a temporary tasting room on the property in what is now a picnic pavilion. At Beltane Ranch in the hamlet of Glen Ellen, fire came so quickly that one guest’s car burned to ashes in the parking lot. Lauren Benward-Krause and her brother Alex Benward oversee the property's 25 acres of vineyards and the historic Victorian ranch house and inn built in 1892. As it often is in peak season, the inn was fully booked with thirteen guests. But at 10:45 p.m. on Sunday, October 8, Benward-Krause noticed an orange glow approaching from the east side of her family’s 105-acre property. It was so hot and so windy that oak trees had already started to splinter and fall. And then she smelled smoke. “I called 911, and I think I was the first call for this fire,” she said, referring to the Nuns Fire which is thought to have originated in nearby Nunns Canyon. Engines from three fire departments fought the flames alongside Benward-Krause’s family and caring neighbors who had showed up with bulldozers to help. They managed to divert the fire around the family’s homes and the inn, but it torched olive orchards and fields. Walking past the skeleton of a horse trailer and the ashen trunks of burned-out oak trees in dusty Birkenstocks, Benward-Krause says the family is just now assessing damage, navigating the insurance, and hiring contractors. “We are still figuring out how to get back to normal,” she told NBC News. Power and water have been recently restored, but there has been smoke damage. Inside the inn, the smell of soot hangs in the air, and a thick layer of dust coats the dining table and artwork on the white walls. The phones are still down and staff still can’t return to work at the ranch. “We have given so many thousands of dollars in refunds,” Benward-Krause told NBC News, standing feet from where the fire almost reached her family’s home. They have had to cancel two weekends of wedding bookings so far and haven’t been able to fulfill any of their wine sales, but Benward-Krause is optimistic they can reopen within a few weeks. “We’re going to be back. We are anxious to get back to work,” she said. It’s a similar sentiment 12 miles south along Highway 12 in the town of Sonoma, where many feel the city was largely spared. Thousands lost power and were evacuated, but only structures at the edge of town were lost to the fire. At Gundlach Bundschu Winery, two barns and the family’s private residence burned down in the Partrick Fire on October 9, but the 160-year-old winery and hospitality areas were unscathed, thanks to the efforts of six firefighters and members of the Bundschu family themselves. Mayer says they haven seen some loss of business in the wake of the fire, but many loyal customers and wine club members filled the tasting room and outdoor patio this weekend. Across wine country, those who rely on the hospitality industry are doing all they can to reopen their businesses. Tens of thousands of people have now returned home and are yearning to get back to work. Others who never left vow they will protect their land and their neighbors again should the need arise. At last count by Cal Fire, more than 1,800 firefighters remain on the front lines of six still active wildfires statewide.